A bittersweet romance of pork and vegetables! The gourd is known as a nutritional powerhouse with many health benefits and herbal properties but along with its myriad of vitamins and minerals is a pronounced bitter taste which can be off-putting to most. To rid of its natural acridity, it is customary for the cook to salt the vegetable and squeeze off its juices before cooking. 1. Marinate pork strips in Lee Kum Kee Soy Sauce, half of the cornstarch and a dash of salt and pepper for 10 to 15 minutes. 2. In a wok, heat cooking oil and stir-fry the pork in batches until the color changes to brown and starts to sizzle, set aside. 3. Using the same wok, sauté garlic and onions until fragrant. 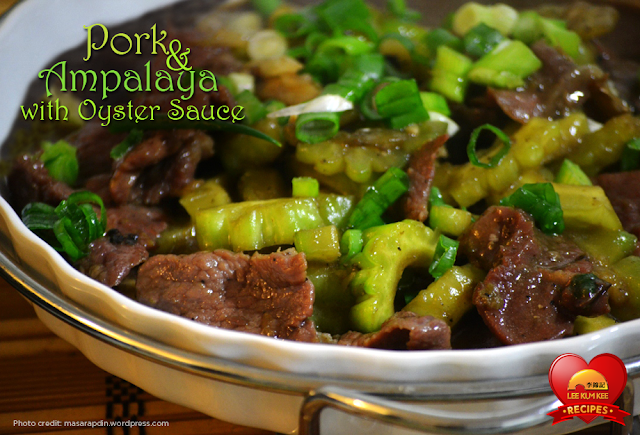 Add in the ampalaya and stir-fry for 1 to 2 minutes then add in ½ cup of water. Continue to cook another 3 to 5 minutes or until the ampalaya is just cooked. 4. Add in the pork and oyster sauce and stir-fry for another 2 to 3 minutes. Thicken sauce with the remaining cornstarch diluted in ¼ cup of water, cook for another half minute until sauce thickens. Add salt and pepper.